If you’re stuck in YouTube overdrive, please check out my Indiegogo rhetoric on this recent Massage Nerd Show appearance, and on this even more recent Downtown Podcast segment with Mack Holiday. Incidentally, Mack studies holidays and noticed the gross injustice inflicted upon nail techs everywhere with the absence of any sort of nail care holiday. So we invented one! April 25th is the final day of Feetish’s Indiegogo campaign, hence we’ve dubbed it “National Mani/Pedi Day”! In honor of this sacred holiday, and as a token of my appreciation to the community who supports these crazy ideas in my head, I will be hosting a casual open house (with treats!) at Feetish on the 25th. Stay tuned! 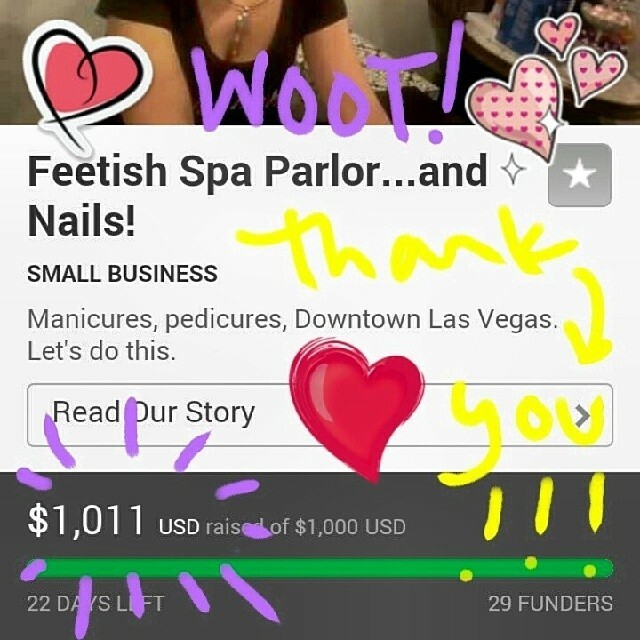 This entry was posted in Downtown Las Vegas, Feetish Spa Parlor and tagged buy, container park, crowd, crowdfunding, day, dermalogica, downtown, downtown project, dtlv, dtp, el cortez, emergency arts, essential, feet, feetish, foot, fremont, Fremont East, fremont st, fremont street, fremont street experience, funding, golden nugget, holiday, incense, indiegogo, juhl, kuumba made, las, las vegas, mack, mani, massage, national, nerd, ogden, oil, oils, parlor, pedi, perfume, podcast, reflexology, salon, sell, soap, spa, vegas, zappos by feetishspa. Bookmark the permalink.